West from Parksville follow Hwy 4 through Port Alberni to Ucluelet , southeast of the junction or northwest to Tofino and the Pacific Rim National Park. You will travel to the tip of the Beaufort Mountain range through stunning lush cedar forests. West of Parksville is Coombs where you will find fresh produce, arts and crafts at the Old Country Markey and Coombs Emporium. Continuing west on Hwy 4, you will pass Cameron Lake (excellent fishing), a long, narrow body of water. At the end of the lake is the MacMillan Provincial Park, a 135-hectare park in Cathedral Grove with its giant Douglas firs and a view of Mount Arrowsmith. Located on Alberni Inlet at the headwater of Barclay Sound 47 km (30 miles) west of Parksville, the island's longest inlet is 40km (25miles) from the Pacific Ocean. 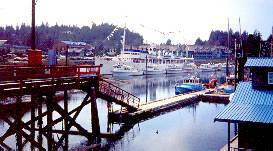 Primarily a mining town (gold, copper and silver) Port Alberni later developed its forestry industry. It is also one of the island's main salmon fishing centres. The town has plenty of accommodation for visiting anglers. Once a passenger, freight and mail carrier, this vessel now makes a four hour trip down the Inlet from Port Alberni to Bamfield giving visitors an oppurtunity to experience this unique area. Interesting artifacts and hands-on displays are featured at this community museum at 4255 Wallace Street. An unpaved road (102 km or 63 miles) leads from Port Alberni to Bamfield and the West Coast Trail. Continue west along Highway 4 from Port Alberni past the shores of Sproat Lake, home of the world's largest water bombers, the Martin Flying Tanks. Climbing through the Mackenzie mountain range you will reach the Ucluelet-Tofino Junction, 140 km (87 miles) west of Parksville. 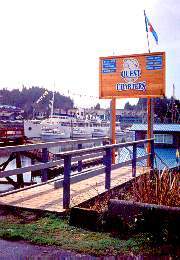 A base for both commercial and sport fisherman, whale-watching and nature cruises, Ucluelet is located approximatley one-third of the way up the Ucluelet Inlet. Local art and crafts are found in shops and galleries throughout the village. The Canadian Coast Guard provides marine communication and traffic service from the Amphitrite Lighthouse (1912) which overlooks Barclay sound and the Pacific. Northwest of Ucluelet is Long Beach and Tofino. 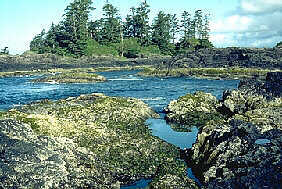 Long Beach (11 km or 7 miles), the Broken Islands Group and the West Coast Trail form the Pacific Rim National Park which extends 105 km (64 miles) along the west coast. The main beaches at Long beach provide easy access via hiking trails. The Wickaninnish Centre provides information on the area. North of the Pacific Rim National Park on Hwy 4 is Tofino. This is traditional territory of the Nootka tribe. Tofino is a fishing base as well as a popular destination for those interested in whale-watching, sea-kayaking, hiking and camping in this majestic area. View interesting marine artifacts and native history here at the museum. It is located in the town centre. Marine excursions are available here. Designed by Tsimshian Eagle Clan artist Roy Vickers, the gallery displays many of his famous world wide paintings. Clayoquot Sound stretches southeast for 65km (40miles) from Hesquiat Peninsula. Temperate old growth rain forest grows within the sound. This area is excellent for kayaking. 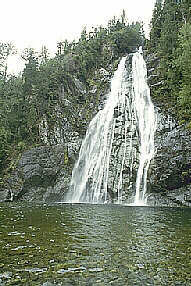 Located in the Maquinna Provincial Park this is the only known hot spring on Vancouver Island. With an ocean view and six natural pools these springs make for a beautiful day trip from Tofino. Boats and float planes are available from Tofino. Meares Island totals over 86 square kilometres with stands of centuries old cedar and hemlock. Tours to see the island and ancient forests are available from Tofino.